employees, wherever they are, on any device. can now get an end-to-end video webcasting solution for All Hands and CEO addresses, corporate training, and so much more. BYOD is much more than an industry buzzword — it’s the new reality of video consumption. Your employees want to watch video on the screen of their choice, and we make it possible to deliver high-quality video to every device. There’s no need to travel to talk to your employees. You can broadcast in high-quality video from the location of your choice to all your employees, no matter where they are. 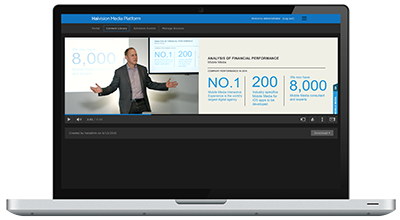 Securely distribute live and on-demand video, such as CEO all hands, company events and IPTV to employees. Centrally manage and distribute IPTV and live corporate content to every screen within a facility. Help your teams record, analyze and review synchronized HD video sources for all kinds of research. Video content manager connecting your audiences to live and on demand HD video wherever they are.